Montezuma is located near the southern Nicoya Peninsula peak in Costa Rica, 41 km (25 miles) southwest of Paquera and 8 km (5 miles) south of Cobano city. This place is well known for its beaches, rivers, and waterfalls and their great beauty. This area also has many residents with artistic and bohemian attitudes. In the center of this small town the visitors will find beautiful wooden houses, restaurants, hotels, and beaches; all these places are within walking distance, therefore it is very easy to move from one side to the other. The Montezuma down town atmosphere is a little like the Caribbean Coast, traditionally colored houses, itinerant artists and a very lively and bustling life on the street. Montezuma offers many places to stay to suit all budgets. You can choose hotels, hostels, or you can rent a house and enjoy all the nature that surrounds this area. You can also find a variety of restaurants; Montezuma is home to excellent cuisine for all tastes. If you are a vegetarian, you will find a variety of options, and despite its location on the Pacific coast, the Mediterranean dishes are a hallmark of Montezuma. The nightlife occurs in some small bars located in Montezuma down town, with open places overlooking the street and the sea. Here you can enjoy the music, and some of these bars have a dance floor for people who like dancing with the music. Montezuma?s hippie roots are evident in the organic market held every Saturday morning; here you?ll find healthy food and souvenirs, while local musicians brighten the morning. Near to downtown Montezuma you will find three beautiful waterfalls surrounded by picturesque rain forests and cliffs ideal for diving. The first waterfall is the highest of the three. For the brave there are several rocks for jumping into the water; locals jump effortlessly, but remember that they have years of practice. If you want to jump please wear non-slip shoes. Here you will find great swimming holes where you can refresh, relax, and enjoy the day. The second waterfall is about 13 meters high, and has a lower point to leap than the first waterfall. You will have to climb up a path using tree roots and a rope, but the effort is worthwhile, because you will find a beautiful view. The third waterfall is best known for its natural swimming pool and its cliffs; you?ll find a rope swing, with which you can enjoy the water in a very different way. The Montezuma Waterfalls become a great day of adventure for the whole family, since it is one of the best attractions that the country has to offer. The waterfalls are located near the Montezuma down town. You can walk there or you can make part of the journey by car, but the road is not signposted. It is a very good idea to ask a local about the trail. You should to start at the main road, through the Amor de Mar hotel, and walk south, then pass a bridge over the river, once you pass the bridge, you will find two paths. Take the right path and walk along the way through the jungle about 20 minutes. During this journey enjoy monkeys and colorful birds, and soon you will find the first waterfall. If you go by car, you can park the car near it for a low fee. The main attractions of Montezuma are its beautiful beaches and waterfalls. In Montezuma, there are several agencies that can provide you information about all the tours that are available in the area, such as: The Tortuga Island tour, where you can enjoy the beautiful beach and you can dive into crystal waters. The zip-line tour passes through the forest. Surrounding the waterfalls of Montezuma The Natural Reserve Cabo Blanco tour is located 9 km south from Montezuma. You can also choose to go fishing, diving, or to ride along the beach, instead of surfing or yoga in one of the hotels in the area. In addition, there are taxi-boats to travel to the city of Jaco, located 50 km from Montezuma. Tambor is located at the southern of the Nicoya Peninsula, in the Cóbano district, in the canton and province of Puntarenas, this was a small fishing village but now part of one of the most important tourist enclaves of the Costa Rica Pacific. Tambor beach has a tropical climate with temperatures ranging between 26 and 28 ° C; these conditions generate the presence of lush vegetation and a variety of species. This beautiful place is a transition zone of dry forest to humid tropical forest near this beach are two large nature reserves Cabo Blanco Nature Reserve and Curú Wildlife Reserve, this semi-private nature reserve, which are of great importance in the conservation of wildlife in Costa Rica. In addition, this area has the Asociación Pro-Conservación de la Lapa Roja (ASOPROLAPA) working since 1996 on projects to protect the scarlet macaw in captivity and subsequent release; the area has a wide variety of mammals such as the howler monkey, squirrel and coati, reptiles like the green iguana, and a variety of birdlife. 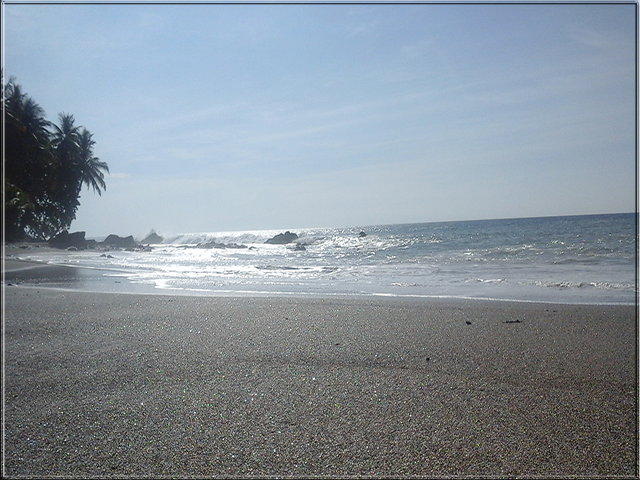 The tourism is the most important economic activity in Tambor beach, its gentle waves, white sands, clear waters and the presence of wildlands areas, has made grow the tourist in the region. Some hotels have their facilities off the coast, and some others are into the town, where you can find a supermarket, souvenir shops, car rental and tour operators, as well as Chamber of Tourism and Commerce. Near Tambor beach you will find important tourist sites such as Pochote beach, Organs beach, Mal Pais, Cocalito, Santa Teresa, Montezuma and Turtle Island. From San Jose to Montezuma & Tambor, you can choose shared transportation, which offers you established departure schedules, and the cost is per person. 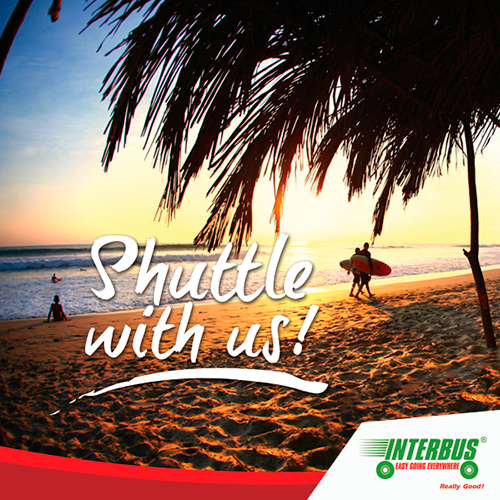 Interbus offers shuttle transportation around 07:30am. The cost from San Jose to Montezuma & Tambor is $52 per person, each way. This shuttle transportation is offered from the most important metropolitan area hotels, and you should just book your ticket in advance. If you want to book please Click here , but if you want to learn more about the routes offered to or from Montezuma please Enter here . The trip from San José to Puntarenas takes about an hour on the 27 Highway, or two hours at the Pan American Highway. This time will depend on the road transit. Once in Puntarenas, you must go to the Ferry Terminal located on the northwest edge of the city, this is where the ferries arrive and depart, and you must buy a ticket. This trip between Puntarenas and Paquera lasts an hour and a half. Once in Paquera you should drive about an hour, passing through Tambor beach until you reach Cobano (this section is fully paved). Then at the intersection of Cobano down town, you will turn left at the Banco Nacional corner, from this point you must drive 8 km more on ballast road until you reach the Montezuma hill, this steep street welcomes you with its impressive landscape to one of the best beaches in Costa Rica. If you wish to rent a car Enter here . You can take a flight from San Jose to the Tambor airport. This local flight takes around 40 minutes; if you go to Montezuma you can choose to rent a car or take a taxi. This journey takes about 30 minutes. The companies that offer these flights are Nature Air and Sansa Airlines. The public transportation from San Jose to Montezuma & Tambor is offered in the Puntarenas Terminal located in San Jose between 12th Avenue and 16th Street, and the public transportation is available from 06:00 to 17:00 hours. It is important to check the Ferry schedules Naviera Tambor so you can coordinate your trip efficiently. Once you get to Paquera you should take another public bus to Montezuma & Tambor.